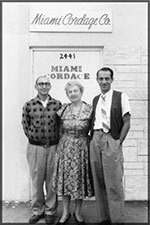 The history of Miami Cordage/Florida Wire & Rigging Works is a robust story that started in 1960 when founder Gene Kaplan began a small business to distribute twine, cord and small diameter ropes. In the beginning years, Gene’s mother Kate handled the accounting and Uncle Ira ran the shipping department. Through hard work and a little blood, sweat and tears, we have grown into a global company with a focus on manufacturing a wide range of fiber ropes and custom assemblies, and as a distributor of marine and industrial hardware; our true American success story. Today, as a women-owned business, Gene’s daughter Kandi Kaplan-Stirman has taken over the reigns of the business and we remain a family owned and operated business, we tremendously value both our employees and customers as part of our large and growing family. The cornerstone of our business has always been to provide superior customer service, its what has been the basis for our success over the years. While we do import a variety of products to meet the demands of the market place, we go to great lengths to keep jobs right here in Miami while remaining both a nimble and competitive company. We are proud to be the only company in the U.S. that manufacturers custom color nylon and polyester rope. We have a tremendous amount of pride in manufacturing quality products while employing local folks and maintaining a competitive edge. We invite you to keep reading and learn a little bit more about our company and its rich history.